Stu Apte, a legendary Keys guide was recently inducted into the Fly Fishing Hall of Fame at the Catskill Fly Fishing Center and Museum in Livingston Manor, New York, on October 6. It was my birthday, May 11, 1982, when my good friend Capt. 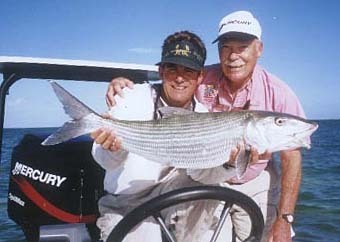 Ralph Delph of Key West fame and I decided to celebrate my birthday by fly fishing for big tarpon at Homosassa, Florida. Just to sweeten the pot, a new TV film producer had heard about the five days we were going to spend searching for that 200-pound tarpon. He asked if he could follow us in a second boat staying out of our way but shooting the happenings. The plan involved having the producer and his cameramen meet Ralph and me for dinner on May 10 at the Riverside Villas on the Homosassa River, but they experienced difficulties renting some of the sound equipment and could not join us until May 13. They would be missing the first two days of fishing. You can probably guess what happens. The morning started off in a normal way, with the two of us taking turns. I led off by catching a pretty nice fish, about 110 pounds, and Ralph muscled one that looked to be around 130 pounds. At that point, a non-fishing boat ran right down the center of the tarpon mecca, leaving us our jaws and fists clinched in anger. This prompted me to suggest that we get away from the boats and run north for about five miles to another area I knew. Capt Rich Tudor, Islamorada, Florida holds this biggest bone that won him the Redbone. Stu looks on. Ralph saw a fish roll about 300 yards away, and we headed toward it. Then about 75 yards off to my right at three o’clock, a school rolled up and went into a daisy chain. A daisy chain happens when a school of tarpon circles a school of baitfish, forcing them into a ball. Ralph poled me up to the daisy chain and we saw a very big female moving in a clockwise circle with maybe two dozen tarpon, with the smallest being about 115 pounds. I knew that I must cast perfectly to get the fly across the other tarpon in the daisy chain without disturbing them. I was using a 12-foot-long leader, knowing most often I can put the leader across some fish without disturbing them. This time my cast was pinpoint perfect, and as I stripped the fly in front of the big female, another smaller tarpon made a quick move taking the fly. I would guess its weight was about 140 pounds. Not the one I wanted, so I tried not to come tight setting the hook. It still came out of the water with a little head-shaker and got rid of the fly. But that’s just enough commotion to break up the daisy chain, and the school slowly swam away. The positioning and my cast went as they did the first time. The difference now was that she wasn’t about to let some upstart 140 pounder take that goodie away from her. I’ll never forget that jump when I set the hook. She blasted out of the water like a Polaris missile. She was fully eight-feet long with a big, thick body. 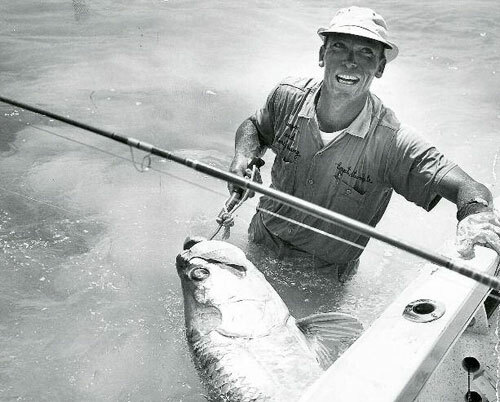 We knew that this was a monster – the quintessential legend of Homosassa. All hell broke loose in the boat. Ralph stowed the push pole and began to lower the big outboard. Normally we’d never crank the outboard with another boat nearby, but we knew this to be an exceptional fish and she was screaming line off my reel like there was no tomorrow. Already, 200 yards of backing had melted off the reel. An archive shot of a younger Stu. He became known in the Keys as Mr. tarpon. This photo also appears in Andy Mill’s best seller, A Passion for Tarpon. Only one other boat is nearby. My friend, Capt. Steve Huff, another outstanding Florida Keys guide, was at Homosassa for the same reason we were. We radioed him and said that we had The One on the line we’ve all been looking for, talking about, and imagining. Steve immediately said not to worry and to go ahead and fire up the engine. He could see the fish when it jumped, and even from that distance, he knew it was a monster. This fish quickly developed a constant rhythm with its tail and didn’t even seem to be exerting a lot of energy. Ralph managed to keep me within 30 or 40 feet of this big lady, allowing me to put maximum pressure on her all the time. During the first 20 minutes of the fight, she rolled periodically, gulping oxygen before heading back toward the bottom. Each time she started elevating, I would put about two feet of my fly rod tip into the water, making her work hard to come to the surface for air. Tarpon have a rudimentary lung and get oxygen out of the air. After fifteen minutes of this, she’d set up a rhythm in her rolling. Now I was beginning to predict when she’s coming up for air. My theory of sticking the rod tip underwater and pulling down and back toward her tail is what I call “down and dirty.” This technique took its toll by making it difficult for her to get oxygen. I wanted this fish to feel that she had to fight her way to the top, a bit of psychology that generally pays off handsomely. Forty-five minutes into the fight, the nail knot from my leader reached the rod tip and then slid past the first stripping guide as the fish neared the boat. I told Ralph that the next time she came up, I’d hold her there and he could hit her with the gaff. He moved from the console and got in front of me in the cockpit. I pressured the fish, and it wallowed like a drunken sailor. Ralph braced his knees on the gunwale and sunk the gaff home just in front of the dorsal fin. In a split second, I glimpsed a view of the bottom of Ralph’s shoes as he vanished over the gunwale into the water beside the fish. He handed the 7 1/2-foot-long gaff handle to me and started climbing back in the boat as the gaff came out of the tarpon’s back. Miraculously, I still had the fish hooked and the fight was on again. Fifteen minutes later, we got the giant tarpon and the boat together once more, programmed the same way. This time, however, I asked Ralph to please use my large barbed gaff that I made especially for a great big tarpon like this one, rather than his smaller gaff, which I firmly believed didn’t possess a big enough bite in the hook. Ralph elected to ignore my plea and instead used his smaller gaff yet again. It’s the same scenario all over again. Except this time when Ralph struck the fish with his gaff, it jerked him clean out of the boat and charged more than 50 yards away with Ralph hanging on like a hitchhiker. Apte 2 flies. Stu also known for his fly tying innovations.